What signs show we are in the season of the Lord's return? Gary Fisher: Yes, I believe we are in the season of the Lord's return. The theme verse of my ministry Lion of Judah has become the second half of Hebrews 10:25 — "Encourage each other, and so much the more, as you see the day approaching." I like that word "see" because that tells us there are visibles that we can notice that indicate the Last Days. Gary Fisher: One of the main ones that we can focus on is Israel. Old Testament theology demands that there is a physical Israel in place in the Last Days. The Messiah cannot come to this earth until that physical Israel is in place. For almost 2,000 years there hasn't been a nation of Israel. Now, we are the only generation in 2,000 years seeing the reestablishment of the nation of Israel. The Jews have become a great population and almost half of the world's Jewish population is back in their land. They are preparing to meet their Messiah. I can't wait! Dr. Reagan: Amen! That is not only Old Testament theology, but it's also in the New Testament, isn't it? Gary Fisher: Absolutely. One reference that quotes Jesus is Matthew 24:32. He told us to watch the fig tree. When you see the fig tree blossom you know that the summer is near. While we can't know the day or the hour of the Lord's return, we can know the season. Dr. Reagan: What does that mean, "watch the fig tree?" Gary Fisher: The fig tree reference can be found in Joel 1:7 and Hosea 9:10. Hosea 9:10 reads, "I saw your forefathers as the first fruits on the fig tree." God is talking about Israel here. He said the generation that sees Israel return as a nation will also be the generation that is going to see all these end time events come to pass. Dr. Reagan: Jesus also said the same thing in Luke where He talked about Jerusalem. He said for us to watch Jerusalem. They will be scattered all over the earth, but the day is going to come when the Jewish people are going to come back, reoccupy the city of Jerusalem, and that will bring about the Lord's coming. Well, brother, we are there. Dr. Reagan: What other signs would you point to besides Israel? Gary Fisher: Oh, there are all kinds of weather signs. We are talking about earthquakes. We are talking about storms. Sure, we've always had those natural disasters, but Jesus said that they would increase in frequency and in intensity as the time of His return nears. Everyday I open up a newspaper and a clipping will report that the latest hurricane was the most dynamic, or the most recent tornado was the most damaging. Everytime I open the newspaper! Dr. Reagan: It's like all of nature has gone crazy today all over the world. But, the world excuses it by saying it's all being caused by global warming. Gary Fisher: The next sign is the great boom of technology we're living during. We've got an incredible increase in knowledge and travel greatly increasing. Dr. Reagan: How does the boom of technology relate to Bible prophecy? Gary Fisher: Daniel 12:4 and 9 says in the Last Days knowledge and travel will greatly increase, and we are the generation seeing all that happen. Dr. Reagan: The fact of the matter is there are many Bible prophecies you cannot understand apart from modern technology, right? For instance, the Two Witnesses of God during the mid-point of the Tribulation will be killed in Jerusalem and left there lying in the streets. We are told the whole world will look upon them. Now, how could anybody understand that before 1965 when satellite television was coming of age? Gary Fisher: Absolutely! Hebrews 10:25 again tells us that there are signs which we can see that note for us the coming of the Lord. And, what are we supposed to do with that? We are to encourage each other with these signs. Dr. Reagan: Anything else that comes to mind about signs that indicates we are in the season of the Lords return? Gary Fisher: There are all kinds of them, Brother. The spiritual condition of apostasy in the Church is one of them. We're the Church Jesus described in the last days that has our shoulders shrugged. We're just not excited nor passionate about anything related to the Bible. The Bible says the final church of the Church Age will dispense with sound doctrine. If that doesn't describe the Church of today, I don't know what does. Dr. Reagan: The Church is up to its ears in apostasy today. Dr. Reagan: You haven't mention the one end times sign that I consider the second most important behind Israel on the list, and that I would say is the reemergence of the Old Roman Empire. Gary Fisher: Exactly! It's amazing to me that in 1948 Israel was reestablished as a nation, and also in 1948 Europe started coming back together as the European Union. The same year! There's something about that, but I haven't figured out yet. Dr. Reagan: It's called "God's timing." Dr. Reagan: As you know, Gary, Bible prophecy has fallen on hard times because many people say it is a playground for fanatics. All those people do is set dates for the coming of the Lord. We've had all kinds of dates set. The press mocks the date-setters. But, we are not saying that we can know the date of the Lord's return, are we? Gary Fisher: Absolutely not! We can only know the season of the Lord's Return. Dr. Reagan: So, let's make that very clear, we are not date-setters. We are not saying that He is coming on a certain date. We are just saying that we can know the season. And, we are in that season. Gary Fisher: Today would be good with me! Dr. Reagan: Yes, indeed. God wants us to know the season because He does not wish that any should perish, but all be brought to repentance. He wants us to recognize that Jesus is coming soon. Dr. Reagan: I praise God that you had the courage to step out in faith and give up a career and begin proclaiming the soon return of Jesus Christ. The tragedy is the apathy that exists in the Church today particularly among pastors about teaching that Jesus is coming soon. Here we are on the very doorstep of the Tribulation, with Jesus about ready to break from the Heavens in the Rapture at any moment, and the average pastor could care less. 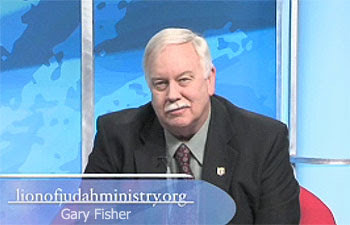 Gary Fisher: There is a commentary that Jesus had about this: "just as it was in the days of Noah, so shall it be in the days of the coming of the Son of Man." There was Noah sitting out there proclaiming a bazaar message. He was out there on the hillside building a boat. The people of that time had never really seen it rain up to that point. And, how many converts did he have? How many people were listening? None. How many people were laughing? All of them. That is the condition we see of the world today concerning Bible prophecy. Noah was truly a Bible prophecy teacher. In the next part of my interview with Gary Fisher concerning Hebrews 10:25, Gary will share his story about how he made a leap of faith and learned to trust God for his daily provisions. COME LORD JESUS!!! WHAT AN EXCITING TIME WE ARE LIVING IN.